Richard Dennis Spivey was born on November 22, 1946 to Celius Dunn and Essie Upchurch Spivey. He departed this life on December 27, 2018 when God called him home. Richard graduated from Dubois High School in Wake Forest, NC. Afterwards, he served honorably as a United States Marine for four years. He fought in the Vietnam War and was awarded a Purple Heart medal along with many other awards. After serving in the military, he retired from AVX in Raleigh, NC after 28 years of dedicated service. Richard was preceded in death by his parents; brother Cecil Young and sister Barbara Ann Gill. Richard leaves to cherish his precious memories his loving wife of 45 years of marriage, Treamenda Brown Spivey; two beautiful daughters: Sharwanda and Yakisiah. 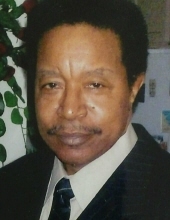 He was affectionately known as “Papa” by his seven grandchildren: Anthemethius “Anthony”, Christopher “CJ” (Britney), Yatill, Avery, Chaise, Torrey, and Emily; three great-grandchildren: Melanie, Mason, and H’Livia; three sisters, Evelyn Crudup (William) of Franklinton, NC, Roberta Harris (Greg) of Wendell NC, and Elsie Mae Spivey Hawkins of Knightdale, NC; one brother: Lenwood Spivey of Wake Forest, NC; five sisters-in-law, three brothers-in-law and a host of nieces, nephews, cousins and friends. To send flowers or a remembrance gift to the family of Richard Dennis Spivey, please visit our Tribute Store. "Email Address" would like to share the life celebration of Richard Dennis Spivey. Click on the "link" to go to share a favorite memory or leave a condolence message for the family.